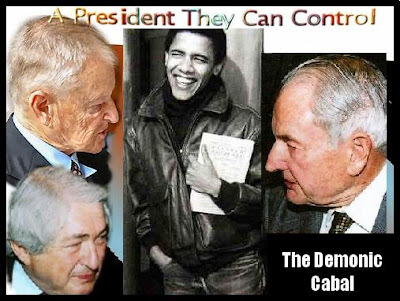 The demonic cabal that's ruled America since the early decades of the twentieth century has retained its power through adjusting its strategies as world conditions change. The Bush-Neocon wing has served its purpose in perpetrating a Reichstag Fire syndrome* catastrophe--9/11, starting a war profiteering armed conflict on two fronts, decimating Constitutional liberties through the Patriot Act and domestic spying, and committing a second 9/11 on the economic front by pulling off a 1929-style collapse of the entire world economy. What happens next will be ratcheting in gains and preparing a fresh new story line [Obama the Messiah]. See photo below. 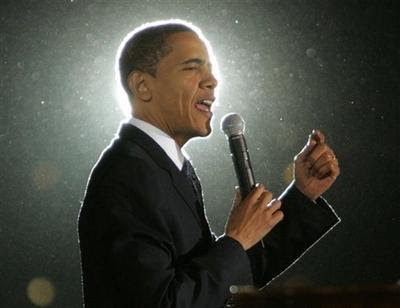 Note how the camera angle depicts Obama with a halo in this photo-op typical of Illuminti poses. "What happens next will be ratcheting in gains and preparing a fresh new story line. That is to say, none of the very impressive (ie, horrific) achievements of the neocons will be undone, and yet the American people will be led to believe that the evils are in the past—the same standard tactic that we saw work so well when Nixon resigned. The media will be filled with fresh new story lines, along with bright intelligent confident reassuring empathetic Earth-loving new faces, plus other new fantasies—and the Bush experience will fade from public memory, along with last season’s football scores. Such an advantage it is for our rulers, that we Americans have such tiny memory spans and such limited powers of independent observation, compared to the rest of the world’s population. I guess the purpose of the melting pot was to melt away our basic intuitive judgment." Global Research, December 27, 2007, "The Post-Bush Regime: A Prognosis"
The cabal has now contrived a powerful, multi-faceted disguise for Obama and the new Democratic administration, making many people believe that he's an independent agent who has genuine regard for the welfare of working people. We have to hand it to the cabal: they've manufactured an effective camouflage for Obama and the neo-liberals, turning him into a cult figure that people accept mindlessly as the new political Savior. When we examine Brzezinski's 2004 book The Choice and his 2007 book Second Chance we see that Obama's policy statements identically echoed Brzezinski's ideas in these books. "Americans must recognize that their patterns of consumption will soon collide head-on with increasingly impatient egalitarian aspirations. Whether through the exploitation of natural resources, excessive energy consumption, indifference to global ecology, or the exorbitant size of houses for the well-to-do, indulgent self-gratification at home conveys indifference to the persisting deprivations of much of the world. (Just try to imagine a world in which 2.5 billion Chinese and Indians consume as much energy per capita as Americans do.) That reality the American public has yet to assimilate. To lead, America must not only be sensitive to global realities. It must also be socially attractive. That calls for a broader national consensus in favor of correcting the key failings of the American social model." Barack Obama, the cabal puppet. The United States will continue as the sole super-power for the foreseeable future, with a brand new assessment of the world situation. "The former major European powers--Great Britain, Germany, and France--are too weak to step into the breach. In the next two decades, it is quite unlikely that the European Union will become sufficiently united politically to muster the popular will to compete with the United States in the politico-military arena. Russia is no longer an imperial power, and its central challenge is to recover socioeconomically lest it lose its far eastern territories to China. Japan's population is aging and its economy has slowed; the conventional wisdom of the 1980's that Japan is destined to be the next 'superstate' now has the ring of historical irony. China, even if it succeeds in maintaining high rates of economic growth and retains its internal political stability (both are far from certain), will at best be a regional power still constrained by an impoverished population, antiquated infrastructure, and limited appeal worldwide. The same is true of India, which additionally faces uncertainties regarding its long-term national unity." "For the next two decades, the steadying effect of American power will be indispensable to global stability, while the principal challenge to American power can come only from within--either from the repudiation of power by the American democracy itself, or from America's global misuse of its own power." The old brand of global militaristic imperialism will continue but will now have a new, amiable facade. "Though hostility toward the United States has risen to unprecedented levels and has not yet crested, an America aware of its responsibilities, measured in its presidential rhetoric, sensitive to the complexities of the human condition, and consensual rather than abrasive in its external relations (in brief, entirely different from its recent emanation [Bush II]) is an America that much of the world would still like to see at the global helm." "The post-1991 worldwide impression of U.S. global military omnipotence and Washington's illusions about the extent of America's power have been shattered by U.S. failures in post victory Iraq. The United States acknowledges the need for cooperation with the European Union, China, Japan, and Russia regarding major issues of global security. The Middle East becomes the make-or-break test case of U.S. leadership." Fascism and imperialism with a friendly face: This is why Obama was chosen--because he is a master at pretending to be an agreeable guy. The reason for the good-natured mask is that Dubya and the neocons pushed the world into a dangerous reactive hatred for the U. S. and the cabal now needs to pretend to be playing nice. The old brand of predatory capitalism will continue but will now pretend to be sensitive to economic and social inequities worldwide. "The exercise of global leadership today requires an instinctive grasp of the times in a world that is stirring, interactive, and motivated by a vague but pervasive sense of prevailing injustice in the human condition." ". . . Income inequality has risen to new heights [by cabal members Steve], with the best paid rewarded at almost obscene levels while average wages have barely crept upward." The cabal understands the need to pretend to be concerned about economic inequality and other worker travails. The "natives" are becoming restless and the cabal must fool them into thinking that they're sympathetic to their plight. "Many, disliking the status quo, are susceptible to being mobilized against those whom they perceive as self-interestedly preserving it." "Only by identifying itself with the idea of universal human dignity--with its basic requirement of respect for culturally diverse political, social, and religious emanations--can America overcome the risk that the global political awakening will turn against it." The old brand of domestic tyranny--devastation of Constitutional liberties--will continue but citizen awareness and agitation will be blunted by creating a new domestic civilian army. [emphasis mine]. "Even civil rights came to be seen by some as an impediment to effective national security. "[Hence the Patriot Act, and the Military Tribunal Act of 2006]. The old non-winnable conflicts in Iraq and Afghanistan will be phased out, but since a primary cabal strategy is ongoing barbaric annihilation through warfare, new armed conflicts will be identified and planned. The general locus for these new wars is what Brzezinski calls the new global balkans. The way Brzezinski describes the global balkans, it's clear there are enough potential hot-spots to satisfy any blood-thirsty barbarian. "Extending from Egypt's Suez Canal to China's Xinjiang region, from northern Kazakhstan to the Arabian Sea, the Global Balkans of today mirror the traditional Balkans of the nineteenth and twentieth centuries in that they are internally unstable and their geopolitical importance causes foreign rivalries. The contemporary Balkans circled above, inhabited by 500 million people, are burdened by internal instability derived from ethnic and religious tension, poverty, and authoritarian governments. Ethnic conflict within the Global Balkans involves 5.5 million Jewish Israelis and 5 million Arab Palestinians. 25 million Kurds and their partitioning states of Turkey, Iraq, and Syria; and between India and Pakistan in the dispute over Kashmir, as well as numerous potentially severe ethnic and minority conflicts in Iran and Pakistan. Religious conflicts involve the Muslims and the Hindus, Muslin Shiites versus Sunnis, and a variety of others." The cabal must select a primary conflict for its most immediate attention, and the choice--surprise, surprise--is Brzezinski's old nemesis: Russia. "A central and massively destructive strategic war, at this stage still feasible though unlikely between the United states and Russia and perhaps in twenty or so years between the United States and China, as well as between China and Russia." 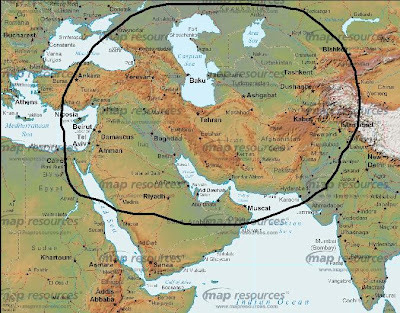 The plan appears to be to surround Russia with missiles, said to be for defense against Iran, admitting all or most of the previous Soviet regions into NATO, and driving Russia into collaboration with China, Venezuela, and Iran. There are many additional insights about new cabal strategies to be gleaned from these two books by Brzezinski; what we've reviewed are merely some of the most significant. I would recommend that anyone who wishes to understand what will be happening in America in the next four years read them carefully. For the truly discerning reader, Brzezinski's discussion of what he calls "an American hegemonic elite"--what I'm calling a demonic cabal--is very informative, not the least in the very fact that he acknowledges that there is a group of "imperial bureaucrats." "Animated by a forceful concentration of knowledge, interests, power, and responsibility, the imperial bureaucrats view themselves as singularly equipped to determine America's conduct in a complicated and dangerous world. . . . A vast web of expertise, access to information and interests abroad is inherent in the exercise of political-military power. Its very scope creates a multifaceted community capable at any one point of marshaling a powerful combination of experience, facts, and persuasion on behalf of a preferred policy." Stay tuned to see how these new cabal strategies play out. You can bet the American worker is going to get the short end of the stick in every way possible since both Bush and Obama follow the Free Trade globalist mantra which will "level the playing field" by driving down wages and driving manufacturing overseas. Remember the cabal plan as espoused by Brzezinski: "broader national consensus in favor of correcting the key failings of the American social model." One of our key failings is the higher standard of living we enjoy with all its benefits vs the rest of the world! By discerning what their new diabolical strategies really are we are forewarned--and thus forearmed. Don't accept their hubris or their lies! *The Reichstag Fire Syndrome occurs whenever a democracy is destroyed by creating a law-and-order crisis and offering as a "solution" the abdication of civil liberties and states' rights to a powerful but unaccountable central dictator. The men of wealth who put the tyrant into power are then able to reap obscene war profits.